Obtaining a license to become a veterinary technician (vet tech) in Oregon is different in some respects from the process followed in many other states. There are three routes to obtaining certification as a vet tech in Oregon. Whether coming from the college route or the work experience route the applicant must have passed the Veterinary Technician National Examination (VTNE). In addition to passing the VTNE applicants for licensing must pass the Oregon Jurisprudence Exam/Regional Disease Test, as well as attend and finish a 20 hour radiation safety course. In Oregon a license is obtained from the Veterinary Medicine Examining Board. In 2005 the Oregon Veterinary Technician and Assistant Association (OVTAA) was formed to win recognition for vet techs and vet assistants in Oregon. The OVTAA is a membership organization which seeks to present a voice for technicians and assistants in the state of Oregon on matters relevant to these employees. There is one campus in Oregon accredited by the American Veterinary Medicine Association (AVMA) to provide approved training in veterinary technology. 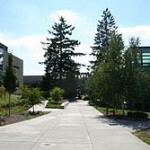 Portland Community College was founded in 1961. It was accredited by the AVMA in 1989. The college offers a two year Associate Degree in Applied Science – Veterinary Technology.